The other night I was flipping through the chapter of my Elements of Styles architectural history textbook that covers the Baroque period, which the authors define as from 1625 to 1714. I discovered that one of the innovations of that era was counter-weighted vertical sash windows, which were developed in the 1670s. Up until this point many windows didn’t open, and those that did were casement windows that swung open. Sash windows are a very common window style in Greater Hartford, especially in houses built in the Colonial style. Our home, constructed in 1911, was built with counter-weights to help make opening and closing easier. They are still in use in many of our windows, and are quite common among older homes in the area. The photo is of the weight in a local garage window. 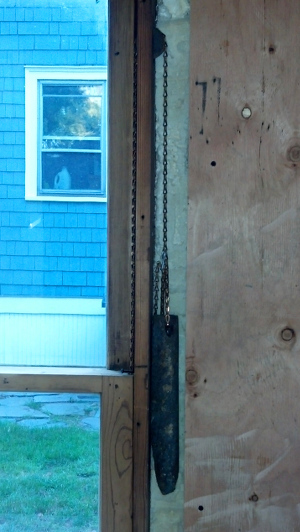 Many windows utilize rope cords to connect the actual window to the counter-weight. This one was switched over to chain, another common material, to reduce future maintenance. Modern sash windows don’t use the weights anymore. Thinking about the local homes I’ve toured, I would guess that the counter-weights were phased out around World War II. This article, titled The History of Sash Windows, goes into a lot of detail about the evolution of the window style, and supports my guess as to the point in time at which the counter-weights were surpassed by other technologies. Interesting stuff … right? They don’t make anything better than Counter Weighted Sash Windows. Ingenious in their design.